From the first image of three automatons stuck in a stark white square of light, to its joyous, explosive conclusion, you absolutely cannot take your eyes off of Blak Whyte Gray. Thought-provoking and intriguing, rhythmic and hypnotic, it is a piece of rare invention and power. The first piece, Whyte, is a rumination on being trapped, on travelling pre-determined routes that cannot be escaped. The dancers barely move, twitching like stuck records or malfunctioning robots. When they are finally allowed out to move across the stage, it is only to grind their way around squares of light like some giant chessboard. They cannot escape their fate, and by the end are silently screaming, their whole bodies fixed in attitudes of pain and despair. The power does not let up as the dance moves into Gray. Rather than watching robots, we now see soldiers crawling, leaping, shooting. There is camaraderie in the way they move and greet each other, and a vicious edge as they fight and die against invisible enemies. They surge around each other as, one by one, they try to escape, each either being thrust up or dragged down by the hands of their comrades. Blak sees seven of the dancers building or rebuilding the eighth (Dickson Mbi) in a rhythmic series of rising and falling. Having built him, they teach him routines and dances which he clumsily follows. Eventually, when ready, they drape him in a scarlet cloak – they might have made him their emperor or monk, guard or god, setting him up on a pedestal to save them. For a moment, Mbi dances alone – precise, graceful, powerful, a real highlight in a whole show full of quality. And then, maybe he was a god after all, as a foot-stomping voodoo-style dance ensues, complete with fluorescent paint and disturbing masks hanging from the ceiling. The masks are reminiscent of the heads of fallen communist statues, lending this section of the dance an intriguing air of political critique. As Blak Whyte Gray enters its final movements, the tone shifts again. The hip-hop which has pervaded every piece loses its staccato, percussive edge and becomes joyous and uplifting. The dancers are freed from the shackles of pain and conflict and finish on a glorious, heart-soaring high. 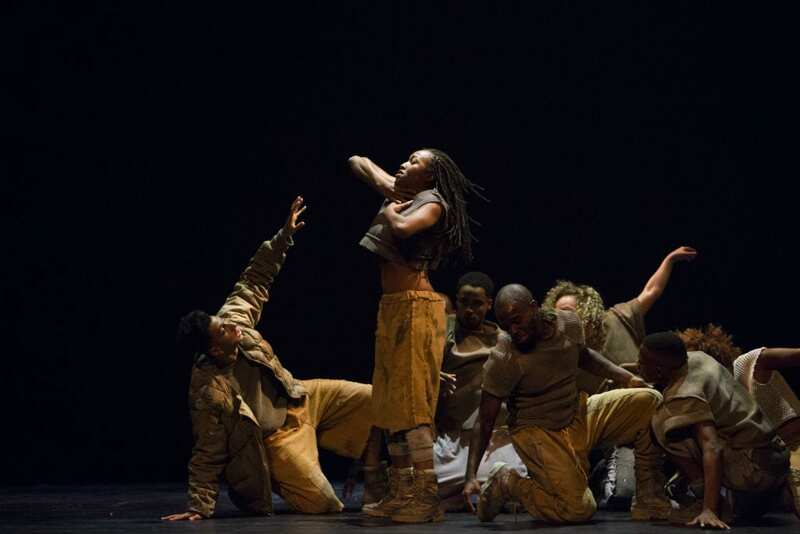 Throughout the whole of Blak Whyte Gray, the dancing and choreography are of the highest quality. The dancers move with precision and purpose, and interchange with ease. At times they strike the stage so hard that the whole theatre seems to shake, at others they rise weightless into the air. 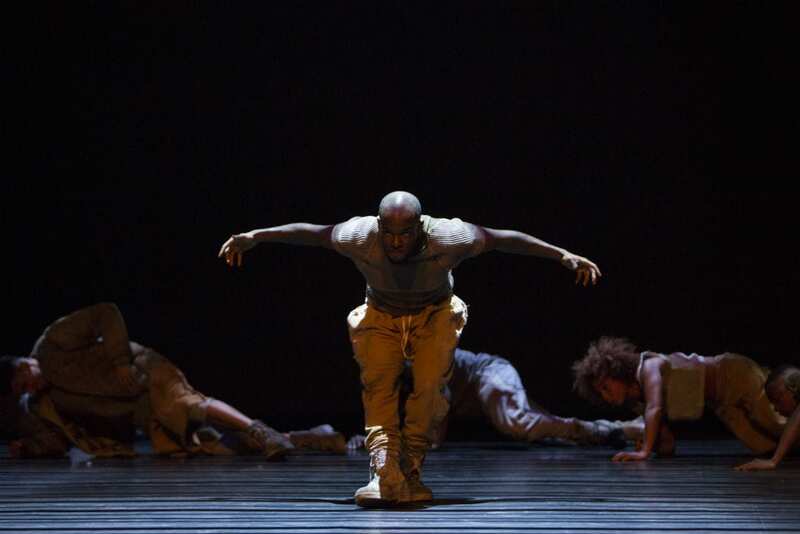 However, this is a performance based on much more than the choreography. The dancing pulses in time with concussive music, shaking the audience in time to the performers. 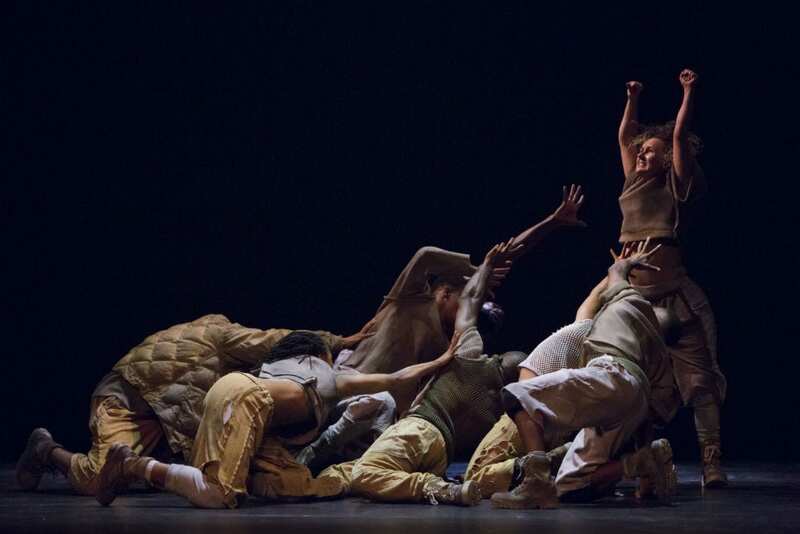 Much of Blak Whyte Gray happens in near darkness, with the dancers looming in and out of bruised orange lighting, with the bursts of brightness even more striking as a result. Ben is an Art History graduate currently working for the National Museums of Scotland. He is a keen watcher and reader of all things theatrical, particularly at Edinburgh’s intimate Lyceum, and has even been known to occasionally tread the boards himself.